We love cruising with Disney, and something that makes a Disney cruise stand out compared to other cruise lines is the variety of fun magical activities that you can sign up to with other cruisers. 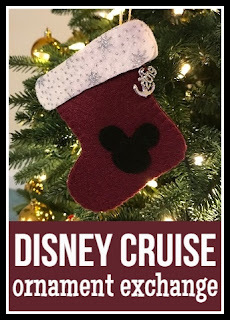 I've written before about how you can add some fun extras to a Disney cruise, and for our upcoming cruise late next year I'm planning on joining in with as much as I can. One of the first things that I've signed up for is the Ornament Exchange. 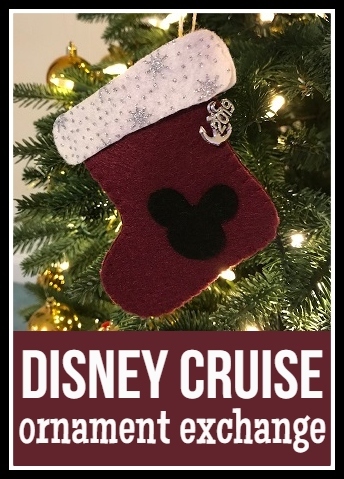 I'll be placed in a group with 10-15 other cabins, and at some point over the cruise we will deliver a Christmas ornament to each cabin and hopefully receive some back in return. 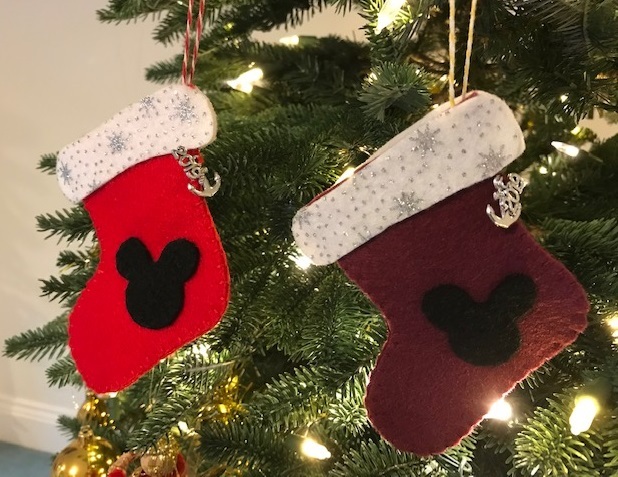 Our ornament exchange has no particular rules - the ornaments can be Disney themed, cruise themed, or just a general Christmas ornament - and they can be shop bought or handmade. Even though our cruise is many months away yet, I couldn't wait to get started on making some ornaments to gift. 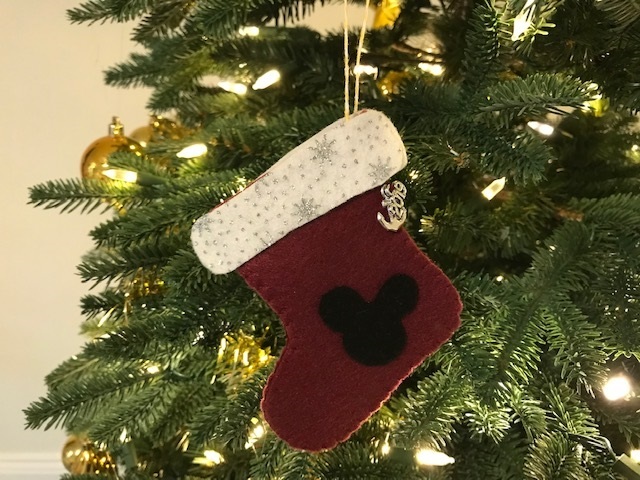 I thought I'd show you my felt Christmas stocking ornaments with a Disney theme, in case you are looking for some Disney Christmas craft inspiration! The decorations were very easy to make. First I found a plain stocking template online which I traced and cut out from plain paper and used to cut out my felt shapes. There are three elements - the main stocking piece, the top and the Mickey Mouse head. I had some sparkly snowflake white felt which I used for the front stocking top, with plain white for the back. Some of the stockings use red felt, some use burgundy felt, and I used black felt for the Mickey heads. I began by sewing the two sides of the stocking together using blanket stitch, which is easy to do and gives the edges a nice finish. If you need some help with the stitch I found this great video from Red Ted Art - How to sew Blanket Stitch. Then I used a larger needle to thread some thick cotton thread through the top corner for hanging the ornament. 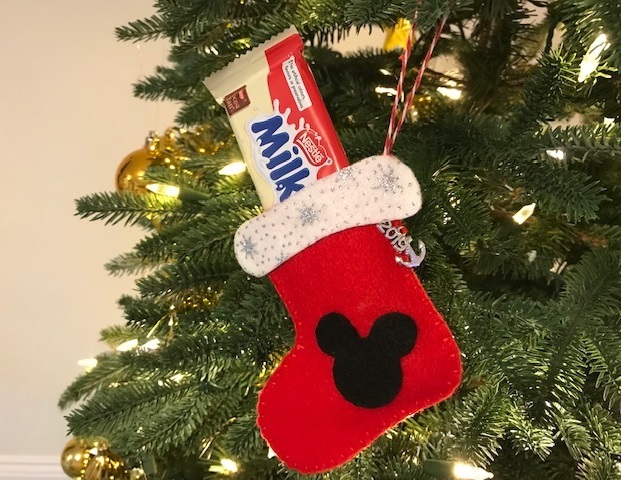 The top white pieces and the Mickey Mouse head are just glued on to the stocking. I used Bostik All Purpose Adhesive (affiliate link) which worked brilliantly, and any fabric glue or a glue gun would also work well. Gluing the white top pieces on last covers up the knot made by threading the hanging cotton through, and you can press them down at the sides to create a neat finish. To finish off the stockings I added a couple of charms which I sewed into the top corner. I used a small anchor charm to represent the cruise (affiliate link) and a small year charm (affiliate link) to show the year, so hopefully it will remind the recipients of their Disney cruise for years to come. 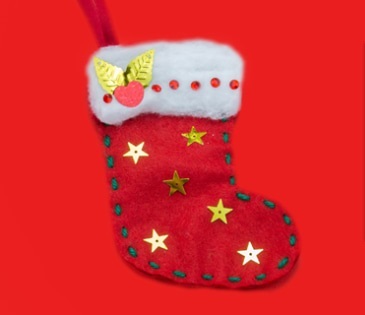 The stockings are designed to hold a small chocolate bar which will form part of the gift. I'm expecting that the majority of our fellow cruisers will be from outside the UK, so nearer the time I'll be buying some local chocolate bars to add to the gift. I'm also planning on packaging them in some Christmas cellophane bags (affiliate link) with some ribbon and a gift tag saying who it is from. I hope that the recipients like them! In the run up to Christmas this year I've really been enjoying my festive jigsaw puzzles. I've got quite a collection now, and I start them as soon as I can in November to make sure that I get them all finished. With a couple of new additions this year I must confess that I've only managed to complete five of the six - I'll need to start even earlier next year! 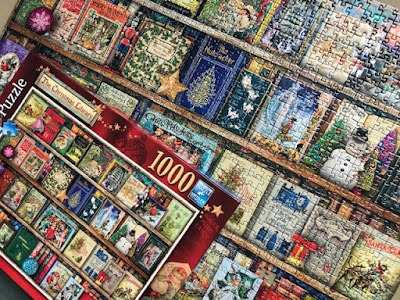 So I thought I'd share some of the reasons that I like to have a jigsaw puzzle on the go, and if you aren't a puzzler maybe it will inspire you to have a go! * It's something to work on when you have a few minutes spare. Much better for the brain than scrolling on the phone! * When working on a jigsaw for a longer period it's the perfect opportunity to let your mind wander. Sometimes I keep a notebook by my side to jot down any ideas that occur to me, whether it's blog posts, craft projects I want to try or other things that I need to do. * It also helps me to switch off and relax, a bit like meditation. I find that I can get completely absorbed, and when I drag myself away to get on with something else I really feel like I've had a break and a rest. * It's sociable - you can work on a jigsaw with other people, while talking to others, or while sitting with other people that are enjoying their own hobbies. * Doing a jigsaw exercises both the left and right sides of the brain, as it's a mixture of logical and creative skills. So it can improve your problem solving skills. It's also working your memory, as you have to remember where you might have seen a certain piece, or what a part of the picture looks like while you hunt for the pieces that you need. * It's a complete break from the screen, as there's no excuse for picking up the phone. I try to put my phone in another room so that I'm not distracted by any notifications. * You get a great sense of accomplishment when the puzzle finished. I leave a completed jigsaw out for a day or two to admire it, and often share a picture on social media! If you don't have any jigsaw puzzles around in the house there are plenty of free websites that let you complete virtual jigsaw puzzles in a variety of different sizes and shapes - just do a quick search and find one with pictures that you like! I'd recommend giving it a go if you are looking for a new hobby! I've been very much looking forward to the Christmas holidays. I love staying at home in the warm, changing to a more relaxed routine and chilling out. At the end of our first full day with nothing scheduled, I found myself reflecting on how things are different today than when I was at home from school over Christmas. 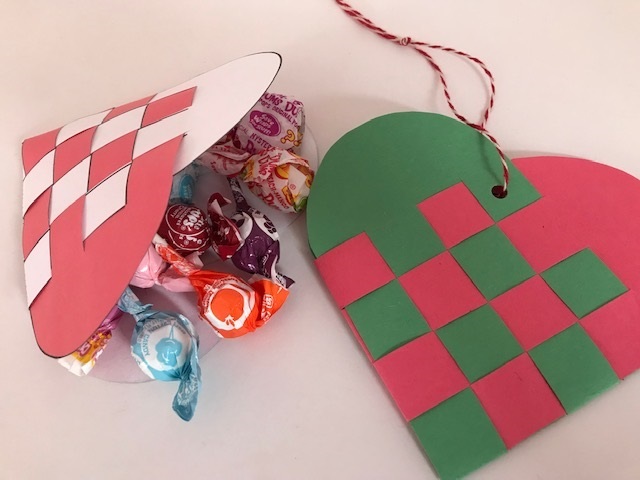 Christmas crafting - I've always loved crafting at Christmas, and I've blogged about my favourite Christmas childhood crafts before. I remember making paper chains, stained glass window decorations from card and cellophane, and gluing cotton wool around a toilet roll tube to make a snowman. Now there is unlimited inspiration on Pinterest, or you can buy craft kits with everything that you need. Clothes - I don't remember dressing up for Christmas, apart from maybe wearing a party dress. I first remember wearing a Santa hat when I was a teenager. Now there's such a range of Christmas themed clothing, not just jumpers but leggings, dresses, t-shirts, matching pyjamas, onesies...! The Christmas tree - When I was little we put our tree up after my sister's birthday on the 10th of December, and it didn't seem at all late. Everyone seems to have their tree up by the beginning of December now, and not just the one tree either! Computer games - We were lucky enough to have computer games to play from when I was quite young, as my Dad used to bring home computers from his school for us to play on. I remember spending hours playing games on the BBC computer, and in particular was pretty good at Chuckie Egg. There was only the one though, and I remember one year in particular when we got a new game - Theme Park - and we had to come up with a timetable to play it as we were all addicted to it. My children have been playing a new game together this week called Zoo Tycoon and I must admit that I can't get over quite how realistic the graphics and game play are. They've been giving me tours of their zoo and it's just like walking around a real zoo! There's no fighting, as there are plenty of game playing devices to go around. Television - a big part of my childhood Christmas was the films and television we watched that was repeated every year. There was The Snowman of course, Santa Claus: The Movie, and the Blue Peter Christmas special. Now the children can just pull up pretty much any film or show that they want from Netflix or Amazon, but they prefer watching distinctly non-seasonal videos on YouTube anyway. Not sleeping - I never really slept at all the night before Christmas. I remember waking up every hour or so and being far too excited to get back to sleep, probably finally getting up for the day at around 5am. Our children were terrible sleepers when they were younger, but Christmas Eve has never been any worse than any other night for us, and they generally appear in our room on Christmas morning at the usual time. Probably the fact that they don't have to share a room helps with this! 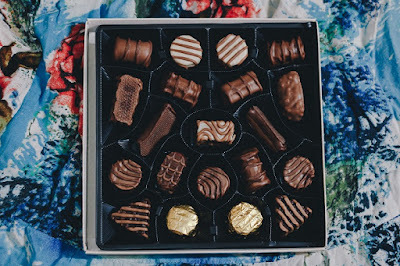 Chocolates - we used to have a box of Quality Street or Roses that was opened for the first time on Christmas Eve and lasted the whole family for days. 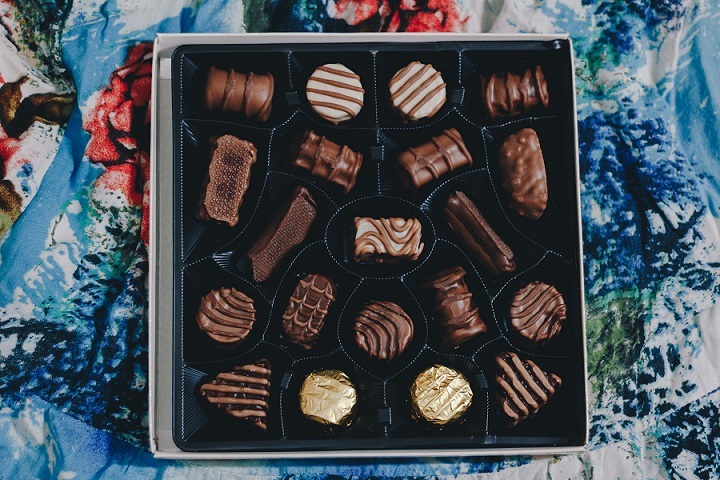 Now we start buying (and finishing) boxes well before Christmas and they seem to be gone so quickly, they don't feel like a treat anymore. Presents - I can't complain at all, I received lots of presents for Christmas when I was little. But there seemed to be a lot more emphasis on choosing one special toy, usually the one that all my friends would get. I don't remember being too specific with what I asked for, so I'd ask for a My Little Pony but any of them would have been happily received. Now there is so much to choose from, and I think a greater expectation to buy more than one large present. 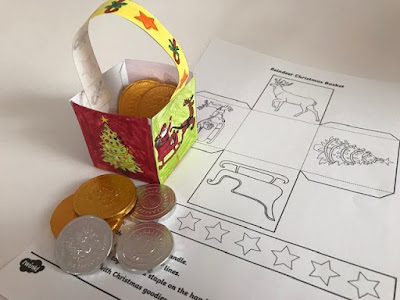 We also micro manage our children's gift lists and give out exact ideas for relatives, which works very well for us (and I appreciate it when other people do the same) but maybe it does take away the element of surprise a little bit. 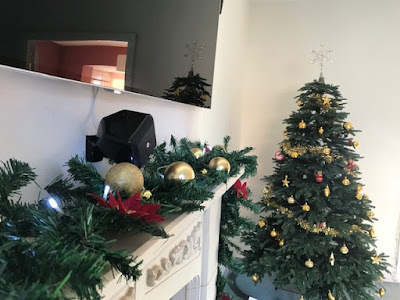 Documenting the memories - I was looking for a Christmas photo from when I was little to go with this post and realised that I have hardly any. Now we take photos and videos as the children open each gift, with the intention of sending it to the giver, and we'll share photos throughout the day on Facebook or WhatsApp so that relatives can see what we are up to. I love seeing photos from everyone else too. I think it's natural to be nostalgic for Christmas past, as things were so much simpler when you were a child and everything was organised for you, and you can remember friends and family that are no longer with us. I hope that I'm creating lots of happy memories for my own children! It's the time of year when I start to look forward to the New Year, and think about all the things that I want to achieve. So I thought that I'd share some of my goals for 2019 across different areas of my life. In November I set myself the challenge of running 50 km across the month. I managed it pretty easily and found that it really motivated me to get myself out for a run. I haven't got off to a good start in December due to having a cold and the freezing temperatures, but I'm determined to meet that challenge again in January. In August 2019 I've been invited to take part in a local 10 km race for a friend's birthday so I need to work on increasing my distance a bit. I probably could run 10 km but it would be quite a struggle and I wouldn't manage it very fast! So I also need to work a bit on increasing my distance per run. I also need to make a much bigger effort to get to the gym regularly. We pay a huge amount in gym fees and at the moment we don't get anywhere near our money's worth. I need to do what I used to do and make a gym trip a regular part of my schedule. 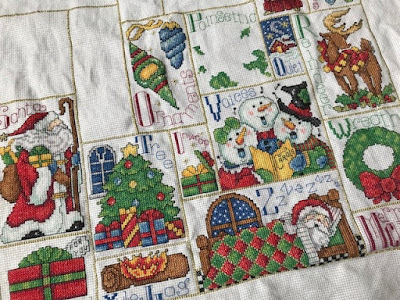 I am determined to finish my Christmas cross stitch sampler by Christmas 2019. This was always my goal when I first started it, but I must admit that I've been neglecting it a little bit lately. I'm about two thirds of the way through with the stitching, but there are lots of beads that will need to be added and I also need to allow time to get it framed so that I can display it when we put up the Christmas decorations. I'm going to aim to finish the basic stitching by the end of June, and have it framed by the end of October. I also want to make a lot more progress on my Persian Tiles crochet blanket as I was doing very well but haven't picked it up in a while. Finally I want to set up a regular craft night with some friends. Everyone always gets so booked up, so I want to try and get organised so that we can get some dates in the diary well in advance. I have a few ideas for some crafts that we could try - I'm going to buy some mini diamond painting kits to have a go at and maybe some silver clay because that looks fun to work with. My blog has just been ticking along lately, I'd like to give it a bit more of a push. I stopped taking on many review posts and hardly do them at all now. I prefer it, but it does mean that I can't keep up with publishing so regularly. 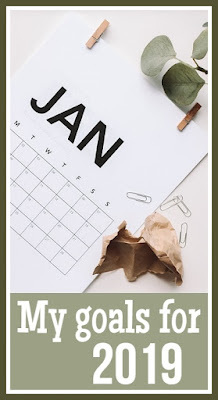 I want to make sure that I have plenty of craft content on the blog and also post more about trying to live a more simple and minimalistic life. I'd like to improve on writing some posts in advance so that I have regular content going out which is hopefully interesting and engaging. 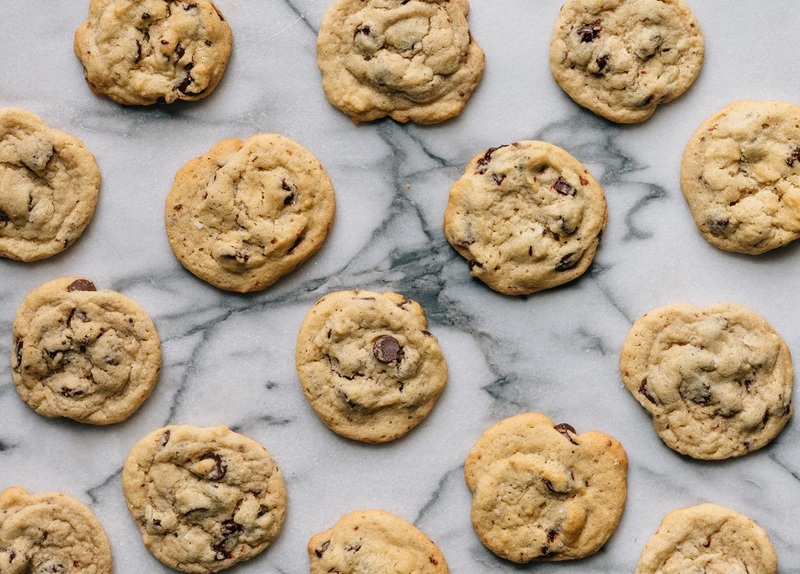 We have a few things that need doing around the house. We need to replace our side gate as the old one is falling apart and we have a few windows that need repairing. I want to buy a big headboard for our bed as we've never had one, and I think it's finally time to decorate our scruffy dining room. The Elf on the Shelf has been an important part of our Christmas traditions for a few years now. We were quite an early adopter, beginning a few years ago with a single elf and expanding to two elves when Mia was old enough to understand. 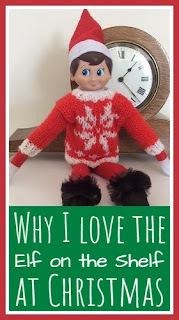 At this time of year I hear so many people saying that they wouldn't have the elf in their house and explaining why, so I thought I'd write about why we love having the Elf on the Shelf to visit us in the run up to Christmas. Some people do go mad with the activities that their elves get up to, but that's because they feel they have to, it's because they want to! 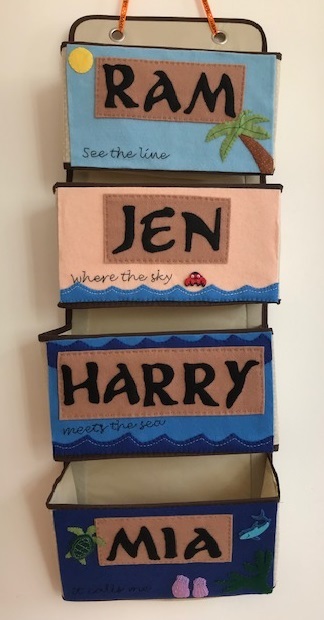 It's really fun to get creative and do something fun for your children to make them smile. But I've generally always kept it low key. Our children are just as thrilled to find that they've moved to a different place overnight. When we bought our elves they were quite new to the UK and only the official ones were available, and they weren't cheap. But now you can find them everywhere for just a pound or two, and you can use the same elf every year. You don't need to buy accessories or props (although my Mum does sell patterns for some fantastic little knitted jumpers! ), you can easily make do with things you have around the house. Although we've told the children that the elves go back to see Father Christmas every night, they don't think they are here to check up on them. We never use them as a threat, or warn the children that they need to be good as an elf is watching. 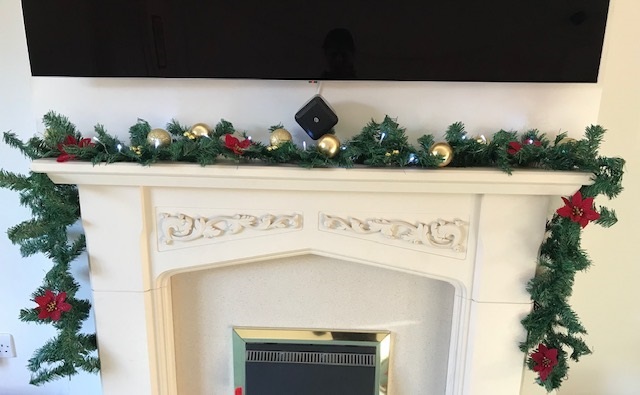 If I do bring up the elf, I'll say that he's sitting in a good place because he wants to watch them play and have fun doing Christmassy things. At 9 and 7 I'm well aware that we don't have long left with our children both believing. In fact I think we are on borrowed time already, or else they are very good at pretending! I love seeing photos of the things that other people organise for their elves. But I rarely share pictures myself. Firstly because I know not everyone wants to see them, and secondly because I just don't feel the need to. Young children won't see pictures on social media unless you show them, and although their friends may talk about what their elves have got up to, I'm pretty sure they wouldn't compare. A point will come when the children no longer believe in the elf. But even when they both realise that the elves aren't really moving about the house by themselves I think they'll still enjoy playing along with me, and maybe some years we can delegate the elf responsibility to the children! Even when the children are older I'm sure we'll still have the elves as part of our traditions. Does an elf visit your home in the run up to Christmas? 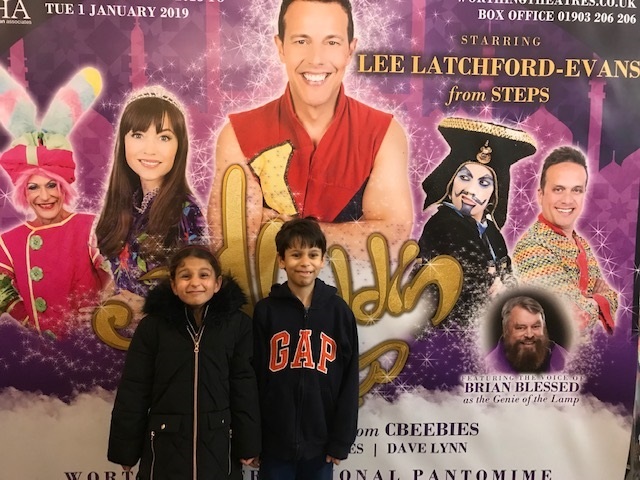 This Christmas we were delighted to be invited back to the Pavilion Theatre, Worthing to see this year's Pantomime - Aladdin. The original story of Aladdin and the Magic Lamp is a middle Eastern folk tale, one of the stories from One Thousand and One Nights which dates back to the 18th century. There's an interesting connection with Worthing - it was originally translated by Edward William Lane at Union Place in Worthing, and so the story returns to the town after 180 years. 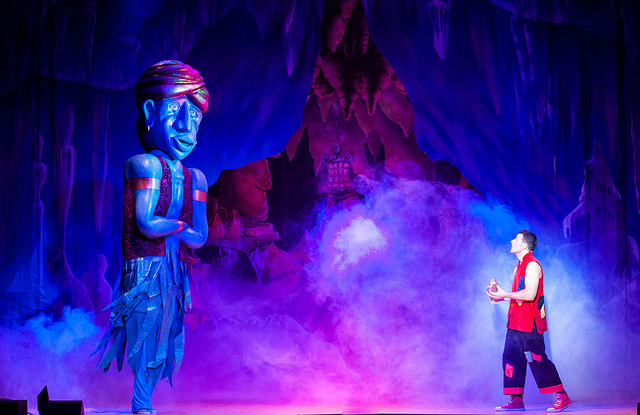 The story of Aladdin and his magical lamp needs little introduction, and most people are familiar with the story thanks to various film and stage adaptations. We follow Aladdin, tricked by an evil sorcerer and trapped in a cave, where he discovers the magical Genie and is able to turn his fortunes around and marry the beautiful princess. 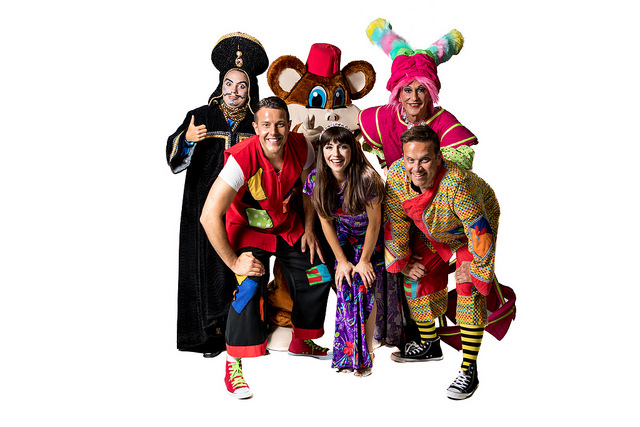 Aladdin is played by Lee Latchford-Evans, famous from Steps, and the princess by CBeebies presenter Rebecca Keatley. Brian Blessed provides the distinctive voice of the Genie, with comedian Vikki Stone as Abanazer, Mark Jones as Wishee Washee and Dave Lynn as Widow Twankey. Once again, the children and I enjoyed a magical pantomime. There were plenty of catchy songs (with of course some Steps classics), great sets and all the traditional pantomime elements. My children are often a bit hesitant when it comes to audience participation, but with a bit of encouragement they were soon joining in with gusto. The performances were brilliant, and Vikki Stone in particular as the baddie Abenazar was a genius casting, you could really tell how much she was enjoying the role! There were plenty of jokes, lots of slapstick comedy, and we all loved joining in with the singalong sequence. We had a great night out and I'd definitely recommend getting tickets! We received complimentary tickets to the pantomime in exchange for sharing on my blog and social media. I do love a Christmas jigsaw. I tend to acquire a new one almost every year, and I try make the time to complete each one in the weeks leading up to Christmas. 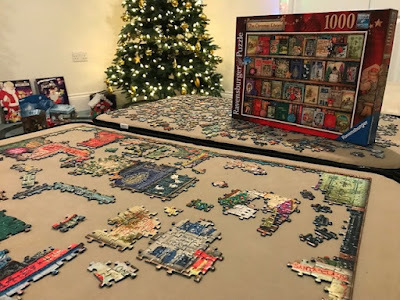 The final one needs to be finished before Christmas day, because I like to spread my jigsaw board out on the dining room table and so I need it out of the way before we eat Christmas dinner! 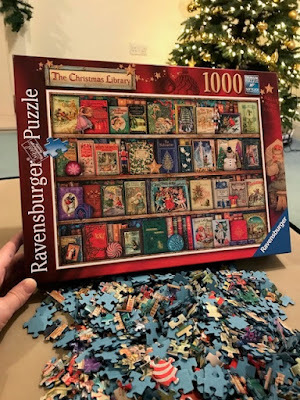 This year I've been lucky enough to receive a couple of new Christmas jigsaws to review from Ravensburger, and today I'm sharing with you the gorgeous The Christmas Library (affiliate link), a 1000 piece puzzle depicting a bookshelf stuffed with classic Christmas books. 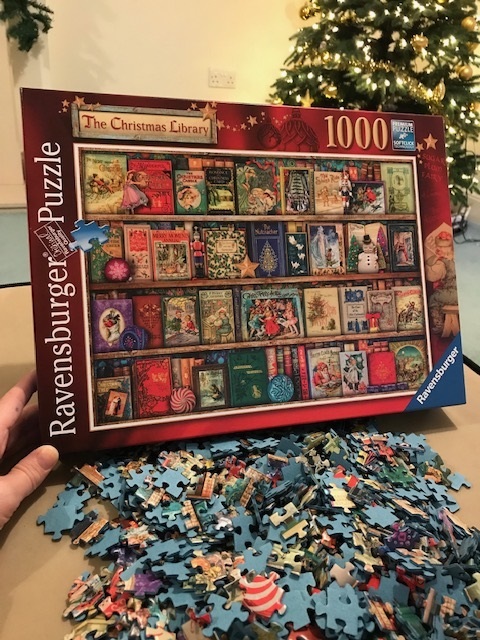 I just love all the bright colours in this jigsaw, and because each book cover is generously sized it wasn't difficult to pick out some of the more obvious titles and get started. It wasn't too easy though, there are lots of similar looking sections and some areas were quite challenging. For example, I normally start a jigsaw with the edges, but I hadn't even found all the edge pieces until I was well into completing it! Like all Ravensburger puzzles the pieces are sturdy and slot together nicely. They also have a lovely smooth finish which doesn't produce too much glare underneath an overhead light - important as at this time of year you don't get much daylight. I loved all the festive images, not just on the book covers but also little Christmas decorations and trinkets scattered across the shelves that were fun to spot and piece together. It's definitely a Christmas jigsaw that will put you in the mood for the season, and there's a good chance that it will also inspire you to dig out some classic Christmas reads! I received this jigsaw in exchange for a review. This post contains Amazon affiliate links. One of my favourite Christmas traditions is the Christmas jigsaw. 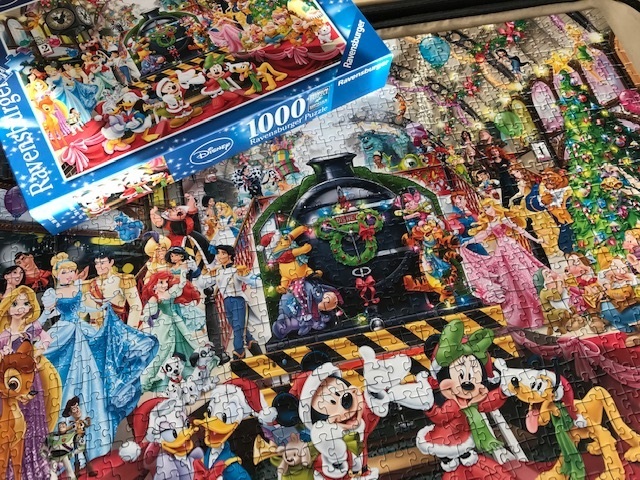 I have very fond memories of working on a jigsaw during the school holidays, and while they don't always need to have a festive theme it's definitely much more fun if they do! Regular readers will know that in this family we are big Disney fans, so we were all delighted to receive a lovely Disney Christmas (affiliate link) 1000 piece jigsaw puzzle to review from Ravensburger. 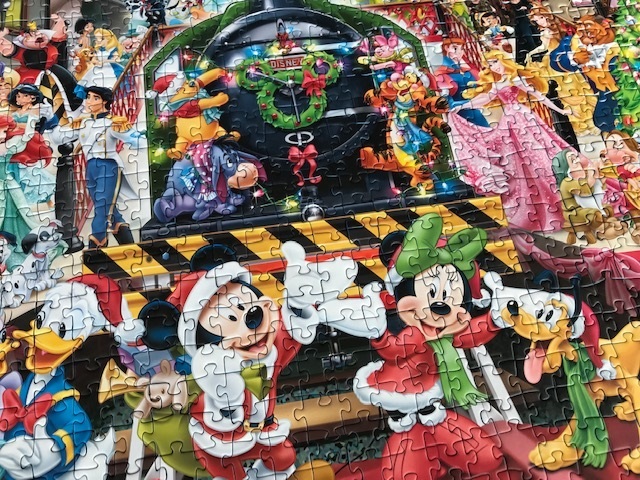 This Disney Christmas jigsaw depicts over sixty Disney and Disney Pixar characters gathered at a beautifully decorated railway station. The train is decorated with a Mickey garland, and the classic Disney characters are positioned in prime position in their festive costumes. There are plenty of different characters to spot, including princesses, princes, fairies and villains, from Disney films old and new. It's a great jigsaw puzzle to work on as a family because the characters are easy to find and pick out, and appeal to all ages. Like all Ravensburger puzzles this jigsaw is very high quality, with sturdy pieces that slot together beautifully. 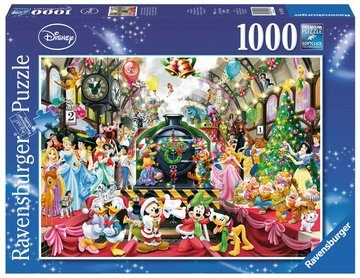 If you are looking for a fun Christmas jigsaw to add to your collection then I'd definitely recommend this one. I received a copy of this jigsaw puzzle in exchange for a review. Amazon link is affiliate. We often hire a car when travelling abroad. It makes a lot of sense if you want to have the freedom to travel around by yourself,and it can work out a lot cheaper than paying for taxis or public transport. However there are definitely things that you need to look out for and be aware of, and this infographic has some great tips and advice to make sure that you don't get caught out. I've always felt that our fireplace feels a bit plain at Christmas, so I decided that this was the year that I would make a small investment and create something a bit more special to help give our living room a real festive feel. 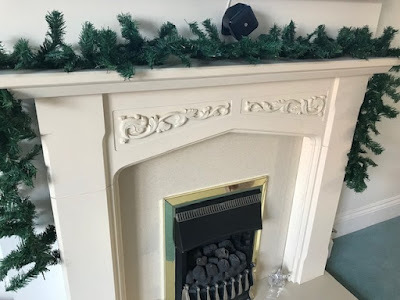 So here's how I put together this simple fireplace garland. First prepare the embellishments that you would like to use. 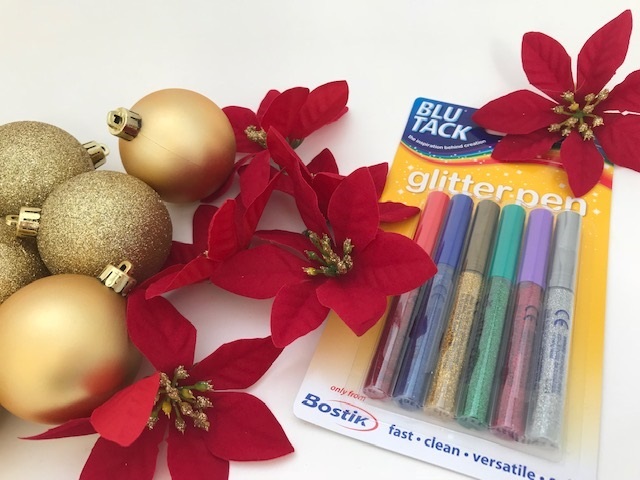 I used some Blu Tack glitter pens to add a bit of sparkle to my plain decorations. I squeezed the glitter glue out onto a margarine tub lid, then used a paintbrush to apply the red glitter to the leaves of the poinsettias and the gold glitter to the plain baubles. 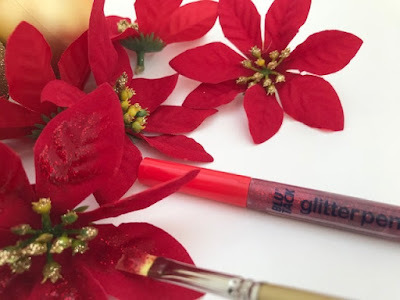 This glitter glue is a great way to apply glitter to a surface without needing to use glue and glitter separately - meaning that there is no glitter related mess at all! 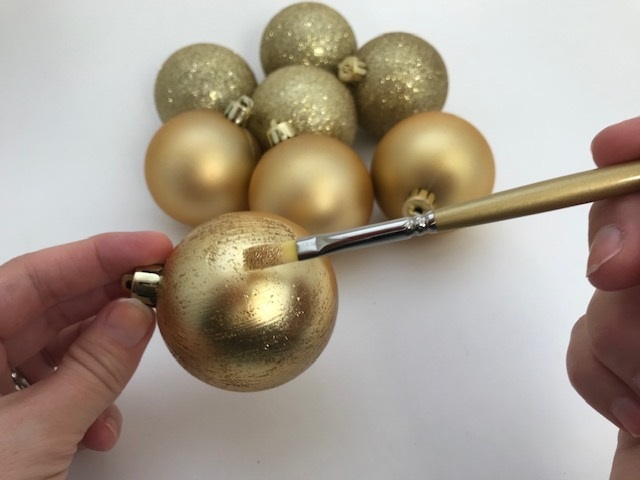 You might need to add a couple of coats to the baubles, depending on how sparkly you want them to be. As I already had shop bought thickly covered glitter baubles in my selection I just added a single coat to give a light sprinkling. It's such a simple thing to do and it really makes a big difference! Next take your garland and lay it out over the fireplace. Make sure that it is the same length on both sides and fluff it out so that it looks full and even. 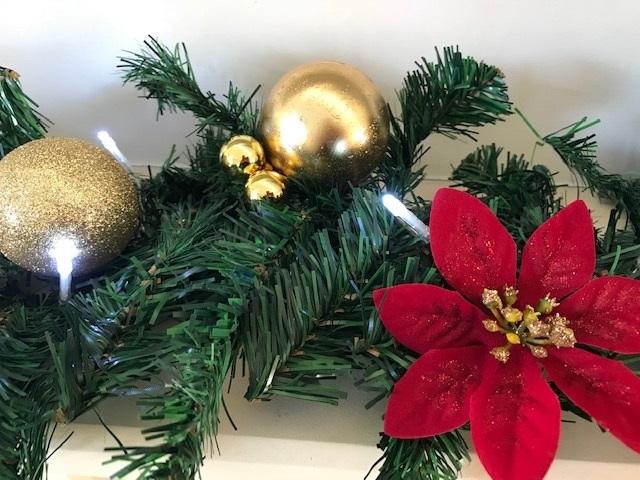 Take your fairy lights and wind them around the garland. It's easiest to do this when they are switched on so that you can check the lights are neatly spaced. If they are battery powered, make sure that the battery box is tucked away somewhere accessible. 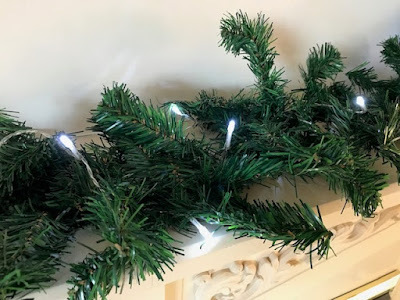 You might want to use a couple of sets to make sure that you have plenty of lights. 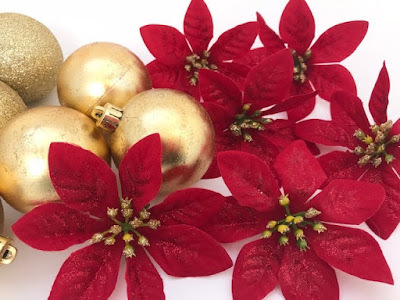 Now it's time to decorate the garland with the poinsettias and baubles. First I laid them out in place so that I could make sure they were spaced evenly and I was happy with their positions. Then I stuck them in place using Bostik Glu Dots. 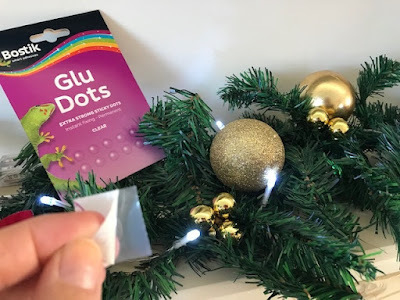 These Glu Dots are very sticky and will adhere to almost any surface. 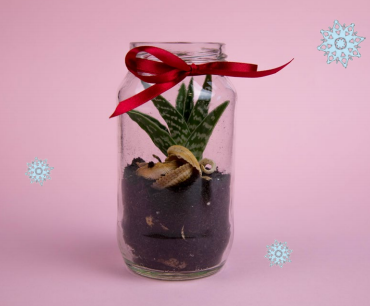 Despite this they are also fairly easy to remove and won't leave any residue, so they are perfect for Christmas decorations which will only be in place temporarily and that they can be removed and reused the following year. The glittered decorations really stand out in the glow of the fairy lights! I'm really pleased with our fireplace garland, I love the red and the gold which is a theme that I'm going to carry on in the rest of my Christmas decorating. Closer to Christmas I'll buy a real poinsettia to stand in the fireplace! This is a collaborative post with Bostik. Contains Amazon affiliate links.